Coordinator: Steve Silver, Community Member. 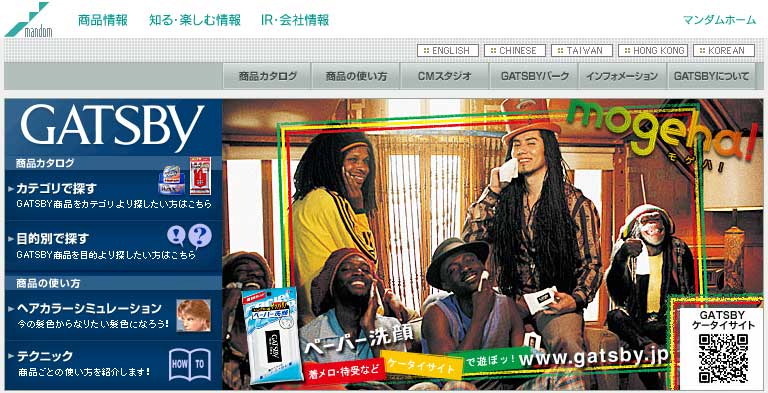 The first CM on the upper left features a group of black men in Rastafarian-looking garb listening to reggae while cleaning their face with a wet towel, the product being advertised. A chimp sitting with them, also dressed in Rastafarian-garb and cleaning its face with a wet towel. The association the CM makes is clear -- black men are like apes, chimpanzees out of the jungle. I hope that the Community can take a strong stand against this kind of racist advertising and demand that the company immediately pull its CM off the air and issue a formal apology. I would suggest writing letters to the editor of major English-language and Japanese-language newspapers, writing letters directly to the company, or calling the company directly to voice your complaint. Debito, if you are reading this, anyhing that you can lend to this effort would be much appreciated. have me). But Steve should front it. something that some people (myself included) might find problematic. Rastafarianism, Judaism is associated with a particular race of people. So, yes, I think it's both racist and mocks a religious minority in one go." definitely address this angle of the issue. PROTEST LETTER TO MANDOM CORP.
We would like to voice our deep concern regarding the content of a Gatsby CM currently airing on television, and request that Mandom Corporation cease broadcasting this advertisement immediately. 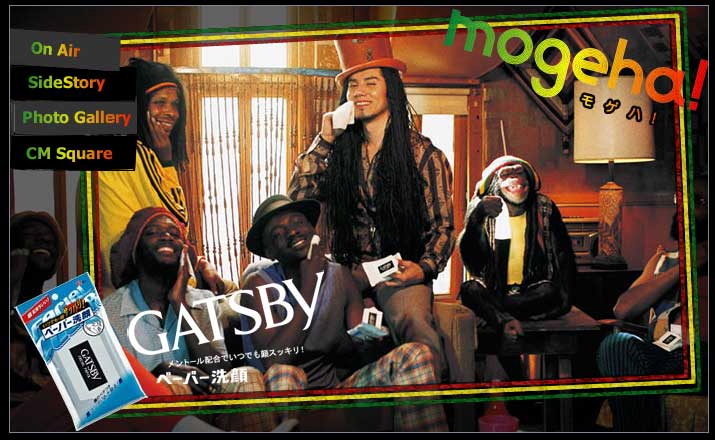 The CM in question is an advertisement for the product "Mogeha" (モゲハ) which features several Black men listening to reggae music while wiping their faces with the product. Sitting on the sofa with the actors is a chimpanzee who is imitating the same action of wiping its face as the Black actors. I find this advertisement to be highly offensive, particularly the use of a chimpanzee mimicking the actions of the Black men portrayed in the commercial. Visually equating Black men as ﾒapesﾓ or ﾒmonkeysﾓ is a particularly egregious racial slur due to the fact that for hundreds of years, Black men have been referred to as apes in an effort to dehumanize and degrade them. Much of the anti-Black racist literature has claimed that Blacks are more akin to apes than to human beings, and the image of the ﾒBlack bruteﾓ has been used to associate Black men as dangerous ape-like savages. Furthermore, dreadlocks in the colors of red, gold, and green are Rastafarian religious symbols. The dressing up of a chimpanzee in such garb would be akin to dressing it up as a Buddhist monk or a Shinto priest. It is highly offensive to members of a particular religious group, one that is particularly identified with Blacks of Caribbean origin, and should be avoided. The use of a chimpanzee mimicking the behaviors of Blacks, in addition to its use of religious symbols as a costume, is, at the least, an extremely insensitive and tasteless attempt at humor. At the worst, it can be construed as a blatantly racist and degrading portrayal of Blacks. We request that Mandom Corporation terminate the broadcasting of this commercial immediately. Furthermore, we request that Mandom Corporation show greater sensitivity when portraying Blacks in future advertisements. I look forward to receiving your prompt response on this matter. article and for Debito to post the article to the Community website. and Japanese people asked questions like, "Are there buildings there?" poor road quality and that lions are found only in national parks. chimpanzee dressed in a kimono? Forwarding an email from Steve Silver <sgsilver@spamcop.net> re The Community's Mandom Project (http://www.debito.org/TheCommunity/mandomproject.html), where Mandom Corp responds to a complaint from an individual Japanese student. The student translates Mandom's letter as is. The original Japanese is available at the above website, along with links to screen captures of the problematic images. Quick comment from me follows the email. Thank you very much for your concern about our commercial and the product. in CM is the symbol of hotness. Rhythm of reggae, time passing slowly, exchange of mysterious language among Motoki and his reggae friends, and also their cute pet Harry, the chimpanzee, these are all one scene in usual days. By describing this scene, we wanted to signalize the refreshing face washing paper, and tried to establish unique world view which Gatsby brand has. If customers receive affinity from the CM, it will lead their trust for the product and our company. We are aiming to create CM which customers will be sympathized with. But we take the fact that we gave such impression by the CM seriously, and take what you have pointed out as valuable opinion. We will consider this when we create CM from now on. Well, that's a bit blithe. Sounds to me like Mandom Corp. is not taking this issue at all seriously, fobbing off the emails of complaint to an underling--perhaps the person who originally designed the advertisement (hand-drawn storyboards visible at the e-conte section of the Mandom site; click on the ad at http://www.gatsby.jp/cm_studio/gallery.html and after a separate window opens up). The author above seems completely oblivious (not to mention a bit defensive) as to why anyone would criticize his or her hard-wrought project. Not even a "sorry if this advertisement caused any misunderstandings", which is standard Japanese operating practice when being politic with customers. I've since passed on the Japanese version of the ad on to my Japanese mailing lists. One response already: ire at the flippant reply. Hopefully more people will now see the gulf in understanding and write something to Mandom directly. On an aside, the Japanese republication of "Little Black Sambo" was at the top of bestseller lists, according to Japanese TV this Sunday. FYI. Feedback about this issue to Steve Silver <sgsilver@spamcop.net>, thanks. We will stop showing the television commercial of Mogeha. We decided to stop showing the Mogeha television commercial which we have been showing since March 28 because the commercial was inappropriate. We deeply regret this, and we apologize to those who had bad feelings from this commercial and all those related. In the future, we will try not to do the same thing. We will have strict checks from various points of view and creeds. We will make an effort to create advertisements that our customers will enjoy in the future. was to create a 'sweet smell'." campaign was 'to take this negative thing and turn it into a plus'. used to break with the existing conventional expectations. Hence Mandom got what it deserves--a hue and cry. As Community Member Matthew Dioguardi argued in his report on this advertising phenomenon, this time Mandom products weren't only strong enough to cleanse sweaty black people--it worked on animals like chimpanzees as well. Glad Mandom saw sense and stopped the ad. Thanks to Steve Silver and several others (like Japanese students at universities and other concerned parties) who took this issue up! Cosmetics maker Mandom Corp. announced Tuesday it has stopped airing a TV commercial that compares black people and monkeys. In the commercial for men's blotting paper, several black people wipe sweat off their faces with the paper, while a chimpanzee beside them in an Afro wig and a multicolored outfit wipes his face in imitation. A human rights group criticized it after it began airing March 28, saying it was comparing black people with monkeys. After consulting with lawyers and advertising agency officials, the company stopped showing the commercial June 9 and has also stopped using a magazine advertisement, saying the campaign "lacked an international sense of ethics." "We are very sorry. We apologize to viewers and other people who felt offended," said Motonobu Nishimura, a company executive. Seventeen years after it was removed from bookshops for its racist content, the children's story Little Black Sambo has made a comeback in Japan. The tale of Sambo, a boy who uses his wits to survive after being stalked by tigers, was a hit in Japan when it was first published here in 1953. In 1988, Japanese booksellers agreed to remove it from their shelves after a US-led campaign against its racist language and imagery. Last April, Zuiunsha, a small publisher in Tokyo, decided to reissue the book - under its Japanese title Chibikuro Sambo - reckoning that today's children would be as enchanted by the book as their parents were. The gamble has paid off. About 100,000 copies of the 30-page book have been sold in the past two months and it has made it into the top five on the adult fiction bestsellers' lists at big bookshops in the capital. The publisher brushed aside claims that it was cashing in on a work that many consider racist, with its depictions of Sambo - a derogatory word for black people - with bulging eyes and exaggerated lips. In the late 1890s Helen Bannerman, a Scot, wrote Little Black Sambo for her children while they were living in India. "Times have changed since the book was removed," Zuiunsha's president, Tomio Inoue, told the Guardian. "Black people are more prominent in politics and entertainment, so I don't think this book can be blamed for supporting racial stereotypes. We certainly had no intention of insulting black people. "Sambo is a brave boy who gets his reward at the end of the story. He fights the tigers using his brain so that he won't get eaten. It's an exciting story and children love it. I hope people will see it the same way." Few protests have been voiced in Japan, which has a very small black community, although an online campaign against the book attracted messages from a few people, mainly Americans. "We have replied to all of them in English explaining our position and have heard nothing back, so I think they understand," Mr Inoue said. Meanwhile, the Japanese cosmetics maker Mandom said yesterday it had stopped showing a TV commercial after complaints that it was racist. In the advert, for face blotting paper, several black people wipe the sweat from their brows while a chimpanzee wearing an afro wig imitates them. "We are very sorry and apologise to viewers and other people who felt offended," a company spokesman said. this is email which mandom sent to me. This is A Community Sponsored Project to raise awareness of social issues affecting Japan's international residents. Check back at this site for future feedback and results.